The Book of Eli – a 7 out of 10 on the Jay Wolin Scale of Movie Reviews. When I saw the previews for this movie, I thought, okay, just another apocalyptical movie, with violence from some relics of the old New York City Punk Rock scene. (ok who remembers Max’s Kansas City in Union Square). Then, I thought ok, they have added a biblical twist to the apocalyptical story. But of course the movie had Denzel Washington (still by far the greatest actor of this era or possibly any era), and of course the religious angle caught my curiosity. I have to admit, I really liked the movie. Although the end had a bit of an interesting but improbable twist (I shouldn’t get picky in an apocalyptical movie), the message of the movie was a good one. Faith helps us on the journey of life to get through difficult times. Everything else was commentary that led to that message. But the wait was worth it. It showed the Bible has the ability to be used for good and evil, and how people’s hearts and minds can be twisted in a desperate struggle to survive. It also touched on how we are consumed with our mission that we forget to live our mission. I love that stuff. And Denzel delivered as usual. 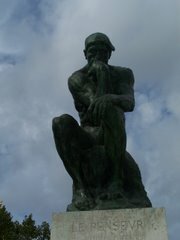 It was a little daunting to realize that Rodin's thinker was also part of Rodin's depiction of Dante's Inferno.